BARTHOLDI'S CONCEPTION of the international memorial was accepted, and in November 1875 the Franco-American Union was formed to make plans, secure funds, and prosecute the program. 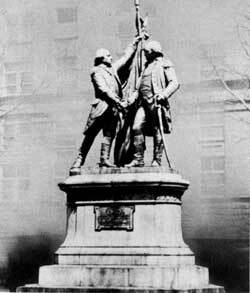 Bartholdi's statue of Lafayette and Washington in Morningside Park, New York City. DE LABOULAYE HEADS FRANCO-AMERICAN UNION. Edouard de Laboulaye was named president of the Union, and among its members were the most notable names in France. It was decided that the finished work of the entire monument would represent the joint effort of the two nations. The French people would build the statue and transport it to the United States; and the American people would build the pedestal on which it was to stand. The French people responded instantaneously, and Bartholdi was able to start work on the statue almost immediately. Public fetes and other entertainments were given to help raise funds. Gounod, the famous composer, wrote a song to the statue which he presented at the Paris Opera. In the spring of 1878 it was decided to organize a lottery to augment the fundthe law of France permitted lotteries for charitable and artistic causes, and the Statue of Liberty qualified under both. It was soon discovered that the statue would cost much more than had been anticipatedthe final cost was approximately $250,000and it was not until July 1882 that the total amount was subscribed. Every penny of this fund was contributed by the French people. The French Government had not been asked to aid in the construction of the statue. 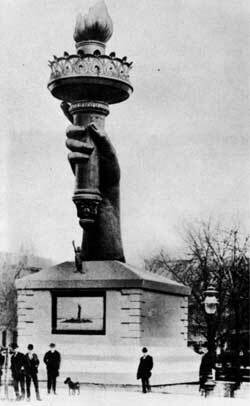 Right arm and torch exhibited at the Centennial Exposition in Philadelphia, 1876. THE AMERICAN COMMITTEE. Word of the proposal to construct the statue reached the United States even before the Franco-American Union issued its appeal for funds in 1875. There was reluctance on the part of Americans to begin construction of the pedestal, however, until some material steps toward creation of the statue were taken, and it was not until September 1876 that a committee was appointed by the famous Union League Club, in New York, with John Jay as its chairman, to secure funds for the pedestal. A similar committee was established in Philadelphia. But public apathy continued, and the necessary funds were not obtained. For this there probably were a number of reasons, among them a persistent belief that the colossal statue would not be completed. Another was the idea that the statue was a New York City project, not national in character. Others did not understand the international implications of the gift. And there were disagreements as to its location. With all these and other misunderstandings, the year 1876 came to a close with no material accomplishment, despite the exhibition of the completed right arm and torch of the statue at the Centennial Exposition in Philadelphia in 1876 and later at Madison Square in New York City. In France, the completed head and shoulders of the statue were placed on public exhibition to encourage subscriptions there. In January 1877, the American Committee for the construction of the pedestal was formed. With a membership of 114 at first, it soon grew to include more than 400 prominent men. William M. Evarts was elected chairman, Henry F. Spaulding, treasurer, and Richard Butler, secretary. 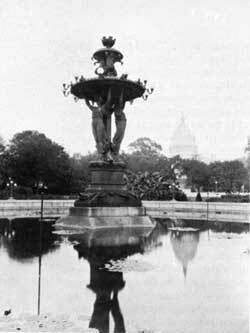 Bartholdi Fountain in the Botanic Garden, Washington, D.C. Calculating that the cost of constructing the pedestal and placing the statue upon it would be $125,000, an immediate appeal was made for that amount. Again, there was a lack of enthusiasm. The committee also found it necessary to double the original estimate. From 1877 to 1881 little progress was made. The majority of the press was hostile, and the people took the attitude that they should not be called upon to finance the construction of "New York's Lighthouse." In 1882, word came from France that the last franc necessary for construction of the statue had been collected and that the colossal figure would be completed in 1883. With the impetus thus given, by January 1884 the American Committee had collected $125,000, most of it from New York. Contracts already entered into soon depleted the fund, and by January 1885 the committee again found itself without a penny in its treasury and with little prospect of obtaining more. Appeals were made in vain to the people, to the New York Assembly, and to the Congress of the United States. In March 1885, Treasurer Spaulding reported that $182,000 had been subscribed, but that all but $3,000 had been spent. He stated that, unless an additional $100,000 could be raised, the construction of the pedestal would have to be abandoned, and it would not be possible to accept the generous gift of the people of France, despite the fact that the statue already had been presented to the American Minister in Paris and had been on display in that city.